Last week I was very fortunate to have KTLA News Reporter Doug Kolk join me as a guest reviewer for Ma’amCakes! A fellow East Coaster (Wayne, NJ), Doug graduated from Hofstra University and began his career in Binghamton, New York. Shortly after, Doug moved to Fort Myers, Florida where he was a Traffic Anchor for WBBH-TV. 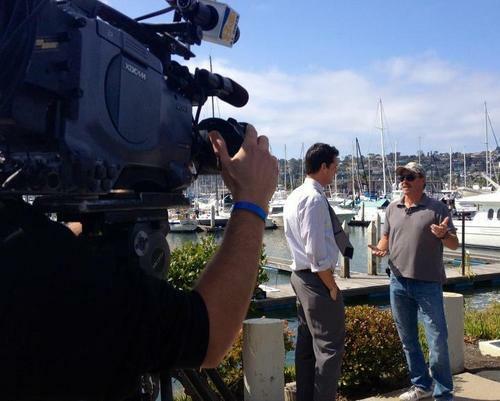 Upon receiving a phone call to transfer out to San Diego, California and work as an Anchor for CBS8, Doug jumped at the opportunity. 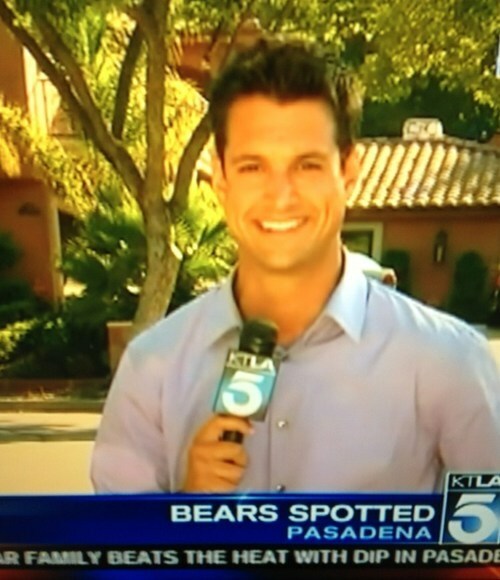 A few years later, (this past April to be exact), KTLA-TV 5 Los Angeles recruited Doug as a Reporter; after Tweeting Ma’amCakes that he isn’t sure where his favorite pancake spot is, I figured I should introduce this Reporter to the world of Ma’amCakes in his new neighborhood. When referring to “the world of Ma’amCakes,” my original plan was to go to The Griddle as they are centrally located, and have some of the most creative pancakes in Los Angeles. However, as Doug informed me the night prior to our review, “Forewarning, I don’t like sweets, and therefore my pancakes come plain,” needless to say, the plans quickly changed. When trying to mask my fear of privately reviewing with this man in the morning (I mean, who doesn’t like sweets? 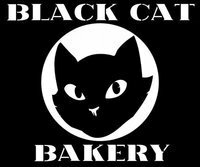 ), I instantly thought of Black Cat Bakery, as that is my go-to spot for buttermilk pancakes in LA. 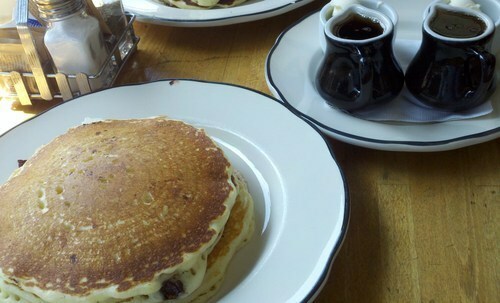 When ordering our pancakes, I stuck with my favorite dish at Black Cat, the Buttermilk Pancakes with Belgian Callebaut Chocolate, while Buddy – I mean, Doug – ordered the house made Buttermilk Pancakes. Seeing this dish puts a smile on my face. Again. Look at those beautifully melted chocolate chips, and the perfectly (perfect meaning not greasy) glistening pancake itself. Black Cat Bakery hands – er, spatchulas – down has the best chocolate chip pancakes in Los Angeles. 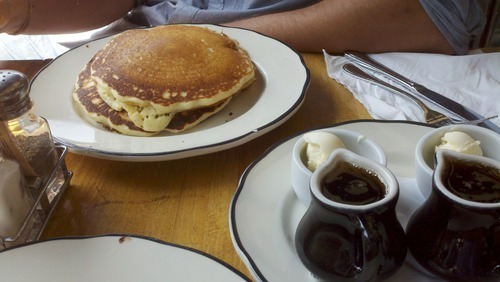 To his surprise, Black Cat served their Buttermilk Pancakes with pure, maple syrup. Well, that sealed the deal! Last minute switch from The Griddle to Black Cat? Score, Ma’amCakes. “I’ll take any excuse to pour maple syrup on something, but these are definitely good,” said Doug. Similarly to Ma’amCakes, Doug has a motto about syrup as well: “For maple syrup, I’ll go as far as eating a pile of cooked dough.” I wasn’t quite sure what that meant, as I don’t exactly see eating cooked dough as a punishment; but for someone who apparently won’t go near birthday cake, I guess Doug takes his syrup very seriously! 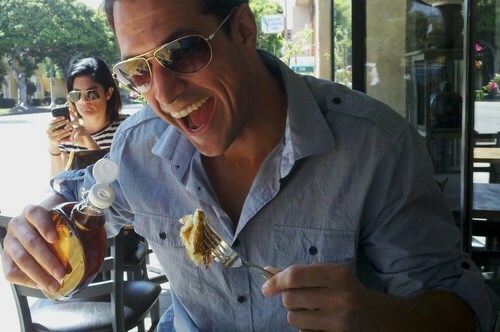 Thanks so much, Doug, for being a part of weekday brunch with Ma’amCakes! 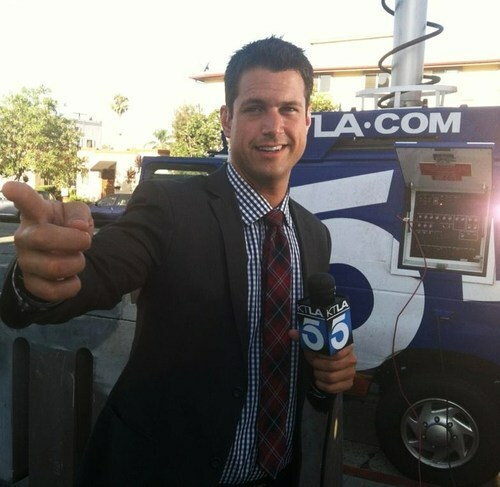 Be sure to catch Doug on KTLA News Channel 5.